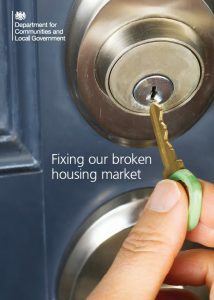 Our response to "Fixing Our Broken Housing Market"
In February the government published a White Paper on Housing under the title “Fixing Our Broken Housing Market”. The full document can be downloaded here. As one of its first tasks our new Housing Policy Group has written a response to the White Paper on behalf of the Society. This has been sent to the Department of Communities and Local Government as part of their consultation on the White Paper. In our response we take issue with the White Paper’s opening statement “The housing market in this country is broken, and the cause is very simple: for too long, we haven’t built enough homes”. We argue that there are many other factors contributing to the failure to build enough homes, explore the more significant ones and where possible suggest what might be done to solve the problems. The full response is too long to repeat here but you can download a copy from this link.